Erasmus, Lifelong Learning Programme, Leonardo… – will they exist in Horizon 2020? The short answer is ‘Yes’! BU holds a number of these awards and I am delighted they will be staying in Horizon 2020 with a huge budget of €19bn. 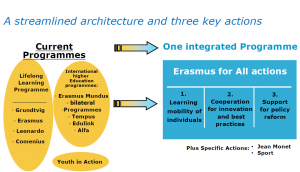 To make things simpler, the EC has streamlined several programmes into one ‘Erasmus for All’ which contains three action strands. 1. Learning mobility of individuals: This is focused on Staff mobility (in particular teachers and trainers); mobility for higher education students; a Master degree scheme and volunteering and youth exchanges. 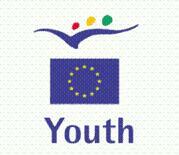 This is where Erasmus Mundus and Erasmus Staff Mobility as you know it will sit. 2. Cooperation for innovation and best practices: This focuses on strategic partnerships between youth organisations and other relevant actors; Large-scale partnerships between education and training establishments and business; IT-Platforms; and cooperation with third countries. Also included in here are the existing Sector Skills Alliances and Knowledge Alliances (the latter is a structured partnership between a university and enterprise to promote an active 2 way knowledge exchange with a focus in partnership, innovation and long term impact; an example is here). 3. Support for policy reform: This includes an open method of Coordination; valorisation and implementation of EU tools; and policy dialogue with stakeholders, third countries and international organisations. More details on Erasmus for All will be posted as I get them and you may wish to read this leaflet produced by the EC in the meantime. Well, wonder no more! You will know from my previous blogposts that the ‘Erasmus for All’ Programme will combine schemes under the Lifelong Learning Programme such as Erasmus and Erasmus Mundus, as well as Youth in Action, Sport and others. The name of the Lifelong Learning Programme (LLP) should be retained as it covers the content of the programme much better and it is known widely in Europe. 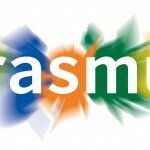 It is proposed that this and other sub-programme names such as Erasmus, Comenius and Leonardo should also be retained. The three level structure of the Key Actions on mobility, co-operation and policy should be implemented but in addition there should be clearer visibility and fixed budgets for each sector. Rather than the proposed 56% of the budget being allocated for this scheme, at least 90% of the budget should be pre-allocated in the proposal so that institutions can plan longer term how they want to use the programme. The draft report will be finalised this week which will then be translated and presented in the Culture and Education Committee (CULT) on 19 September and should be voted on in CULT in November. The vote in plenary is currently scheduled for January 2013, but is subject to the Council’s proposal on the EU Budget for the next financing period 2014-2020. 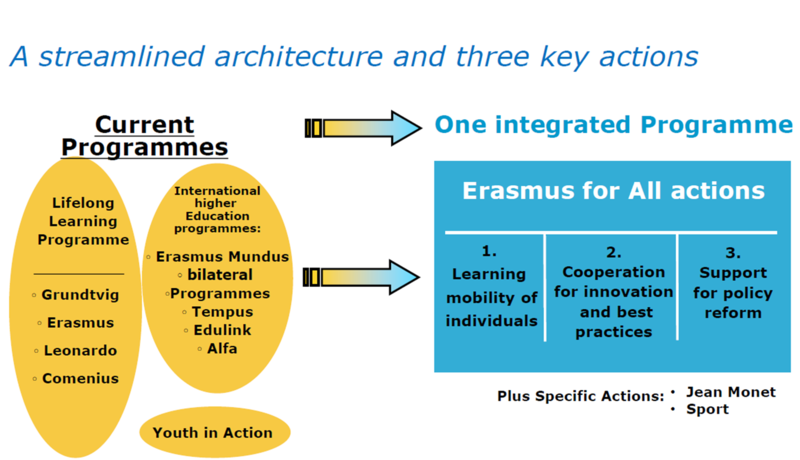 It is also proposed that “Erasmus for All” will have a new category of transnational partnership called Sector Skills Alliances (SSA) to promote cooperation between three categories of partners: the world of education and training (VET providers); sector-specific expertise (including social partners, sectoral federations, Chambers etc. 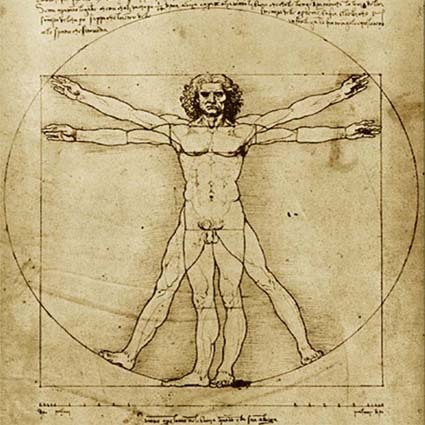 ); and bodies involved in education and training systems (public or private bodies or authorities). Drawing on evidence of skills needs and trends, SSA will work to design and deliver joint curricula and methods which provide learners with the skills required by the labour market. The overall goal is systemic impact on training in the economic sectors concerned in order to increase their competitiveness. The current call for proposals provides and direct support for testing Sector Skills Alliances to draw lessons for future implementation. The European Commission has launched a call for proposals for the provision of support for European co-operation in education and training under the Lifelong Learning Programme.